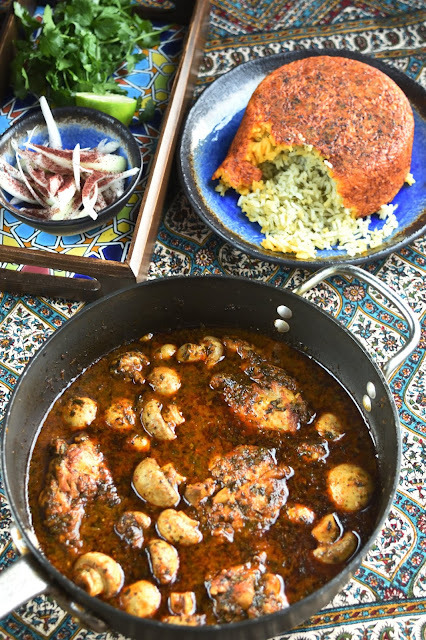 This stew is inspired by the South Iranian fish stew, called "Ghalye-mahi." The original South Iranian stew, heavily influenced by Indian ingredients, contains cilantro, fenugreek, and tamarind juice. 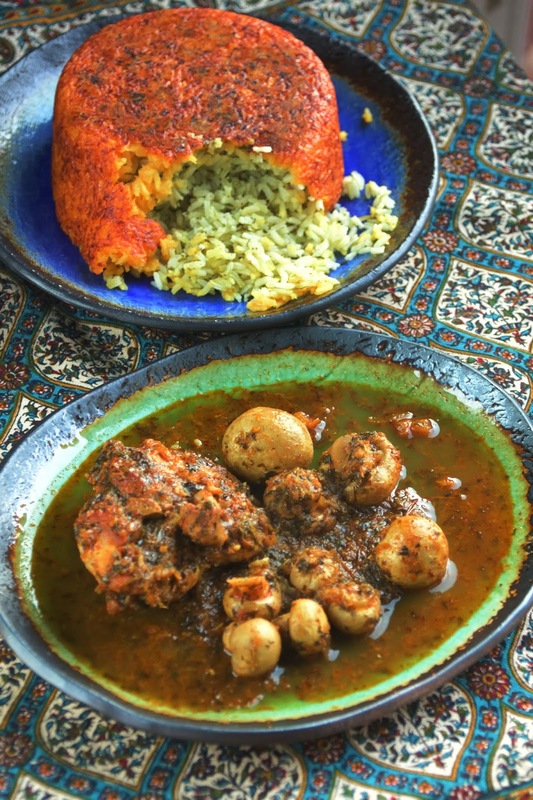 In the presented stew, the authentic tamarind is substituted with ground Persian lime powder. Furthermore, the fish is exchanged with chicken and mushroom. * This may be substituted with a quarter of a whole preserved lemon. Finely chop the cilantro, garlic cloves, and onion. If using a food processor, make sure the herbs do not release their juices (i.e. do not puree but very finely chop). Brown the thighs in a hot pot, set on medium high heat. Do not add extra oil, if the thighs have their skins on, otherwise add a TBSP or two of vegetable oil. Add the chili powder, turmeric and toast in the oil. 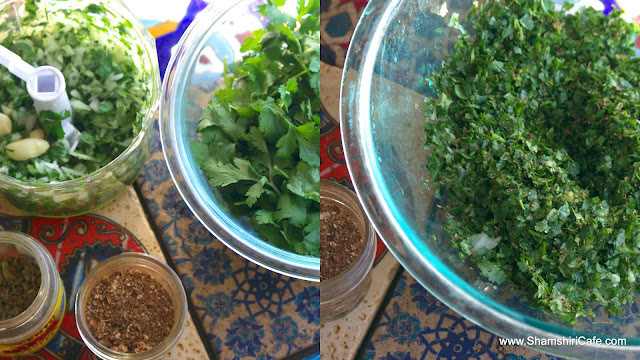 Add the herb mixture and dried fenugreek. Toast the herbs in the oil for five minutes. Add the ground lime powder and enough water (just to cover the pieces) to stew the meat. 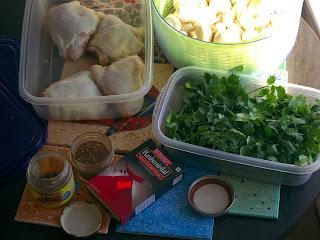 Reduce the heat to medium-low and cook, uncovered, until the chicken is cooked and all the water is evaporated (about 20 minutes). Increase the heat to high, add the mushroom, cover the pot and let mushrooms steam for five minutes. Do not overcook the mushroom and make sure their size is not drastically shrinking due to loss of moisture. 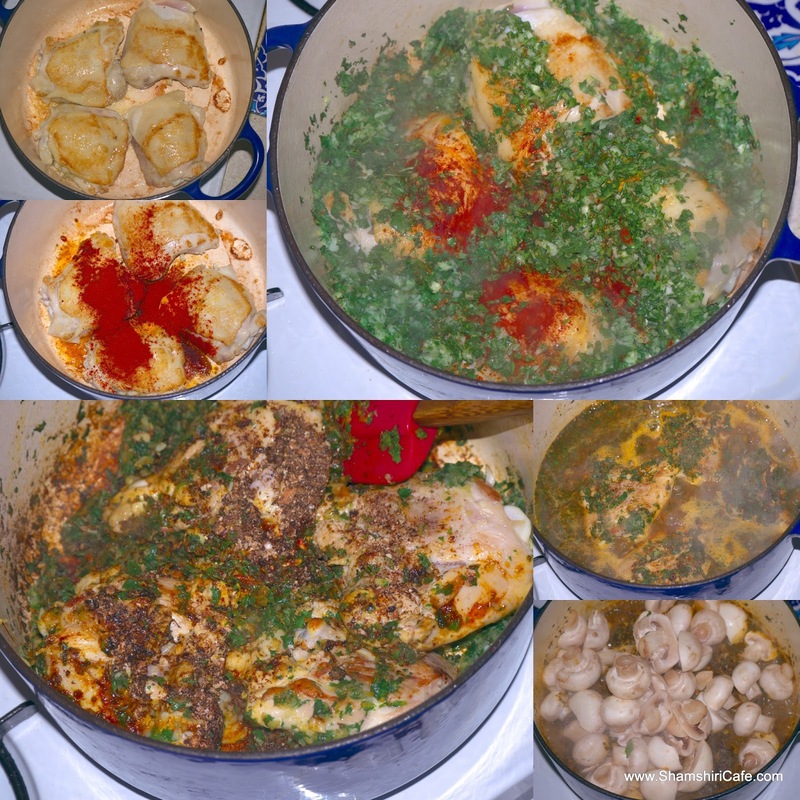 The stew can be served dry with evaporating all the water or, with retaining the water (as seen above).